The documentary, narrated by Chris Rock (his funny is effortless) is well produced and I'm certain fans will appreciate the journey back to the late 80's/early 90's. Those who rep L.A. will have an instant connection to the footage in film. And the youth, who probably didn't know Dr. Dre was a member of another group before there was an NWA, or an Aftermath, will receive a history lesson. After watching the documentary, I gained a better understanding of Eazy E, the businessman. A panel discussion moderated by writer Cheo Hodari Coker with DJ Yella and Eazy E's son, Lil Eazy followed the screening. 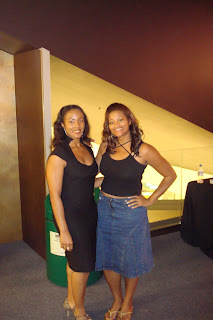 John Singleton was in the audience and told his story of having to pay Eazy E. 50 grand to use the title, Boyz In The Hood for his critically acclaimed film of the same title. 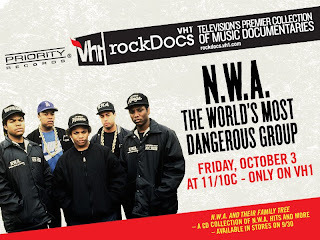 Tune in tonight at 11pm on VH-1. 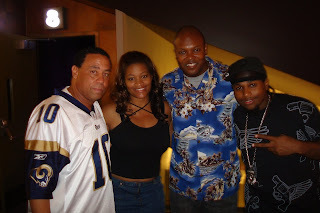 DJ Yella, Tiff (creatiffchatter.com), writer Cheo Hodari Coker, and Lil Eazy E. after the screening. Rayshon, thanks for the invite! I love NWA. I just saw the documentary. It looked like it was a bunch of footage taken from E's True Hollywood Stories. I was shocked when I realized it was Chris Rock.